This idea from three year’s ago is a definitely new twist of Shepard’s Pie. This one actually tastes good and you’ll be proud to bring it to the table. Are you ever embarrassed by a dish that is ethnically yours? I am. I am Irish and I’ve tried Shepherd’s Pie for decades and been endless disappointed. It’s a peasant dish and historically was made with cheap meat. Restaurants are all too happy to follow that cheap path and the restaurant results are, in a word, disgusting. I’ve never, never had one I even wanted to finish. So, I was happy to see this recipe in Brooklyn Bar Bites. Gone is the meat. In place is a bevy of late summer and early fall vegetable fare. And there’s a mushroom sauce to give you that rich flavor that traditional meat is supposed to supply but rarely does. This is an ideal dish for fall, a perfect side and, with that sauce, rich enough to dominate and be the star of the meal. There are lots of vegetable ingredients here. Feel free to mix, match, and use your imagination. Visit a farmers’ market and collect what is fresh from the fields. This is a lovely dish. The lovely photo is from Jennifer May, who decorates Brooklyn Bar Bites with her photographic art. Visit here for a review of the book. I hope you can carry it around and walk through the bars of Brooklyn. In not, just get a copy and follow along with these wonderful recipes. Heat 2 tablespoons of the olive oil in a large skillet over medium heat. Add the carrots and butternut squash and cook, stirring occasionally, for 10 minutes. Add the zucchini, corn, and peas and cook until all the vegetables are tender, 10 to 15 minutes. Add salt and pepper to taste and set aside. Heat the remaining 1 tablespoon olive oil in another skillet over medium heat. Add the garlic and cook until softened, about 2 minutes. Add the kale and salt and pepper to taste and cook, tossing with tongs, until the kale is wilted. Drain the kale well, squeeze, and wrap in a kitchen towel to remove excess liquid. Set aside. To make the mashed potatoes: Rinse the potatoes in a colander under cold water until the water runs clear. Put them in a large pot with the garlic and salt to taste and add cold water to cover by 1 inch. Bring to a boil, then reduce the heat and simmer until the potatoes are tender but not mushy, about 15 minutes. Drain in a colander set over another pot or bowl; reserve the cooking water. Transfer the potatoes to a stand mixer fitted with the whisk attachment and mix until smooth. Stop and scrape down the sides with a rubber spatula. With the mixer on low speed, add the olive oil and enough of the cooking water to make a very smooth puree. The potatoes can also be mashed by hand with a potato masher. Taste and adjust the seasonings if necessary. The mash can be finished with the butter and cream, if desired. Set aside. To make the mushroom sauce: Heat the olive oil in a large skillet over medium-high heat. Add the onion, garlic, carrot, and celery and cook until just softened, about 5 minutes. Add the mushrooms and salt and pepper to taste and cook until the mushrooms begin to brown. Add the wine, vinegar, and bouquet garni and cook until reduced by half. Add the water and simmer until reduced by half. Taste and adjust the seasonings if necessary. Remove the bouquet garni and drain the mushrooms and vegetables in a sieve set over a saucepan, then transfer the mushrooms to a bowl. Cover the sauce to keep warm. Preheat the broiler. Arrange the ring molds in the centers of 8 flameproof plates. 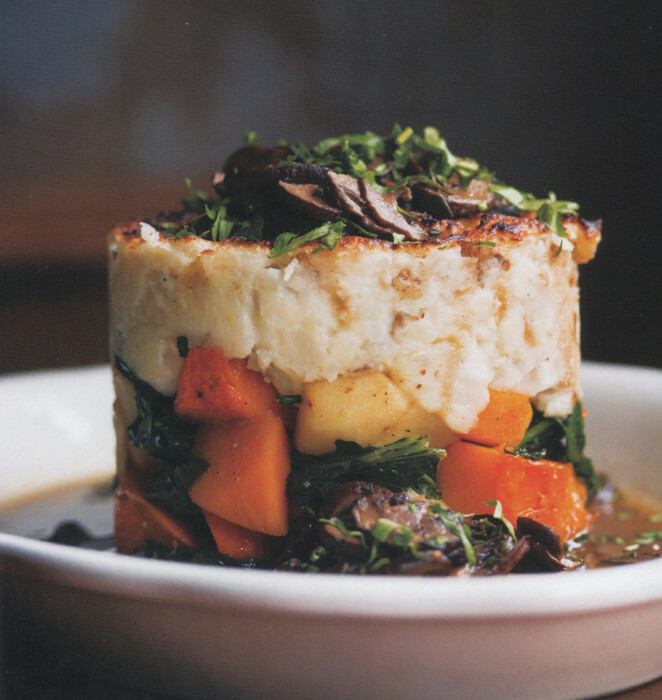 Layer the kale, mushrooms, and sautéed vegetables in the molds. Top with mashed potatoes. Broil until the top of the potatoes is nicely browned. Remove the ring molds. These will be very hot, so remove with tongs. Spoon the mushroom sauce over the pies, sprinkle with sea salt and the herbs, and serve.